NASHIJI-HADA is one kind of appearance of steel surface. "nashi" is a Japanese pear. "ji" is surface. So "nashi-ji" means a surface like a pear fruit. It may be able to translate to "pear grain steel", right? The word "nashi-ji" is used not only for blades, but also for other crafts. It is used for the surface that is filled with particles. An example; gold nashi-ji scabbard. Very small particles of gold are fully plastered with urushi lacquer. Nashi-ji of blade steel is also filled with particles. The view of "nashi-ji hada" steel is covered with full of fine particles (jinie), and the layer pattern sinks down under them. The particles appears like making a small wood grain that is free from the layer pattern. It is one of the most beautiful view of blade steel. Nashiji-hada is most popular in the Awataguchi school in Kyoto 13th century. By careful study, the steel of it has a little large layer pattern, but fine particles fill the surface. It looks like a very small wood grain made of twinkle particles. 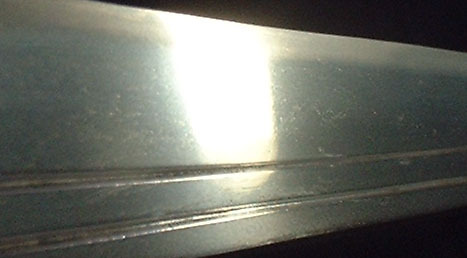 A frontal view of an Awataguchi Kuniyoshi tanto. It is difficult to take a picture of jinie activity. Awataguchi's steel colour is bright and clear. Of course a snow white hamon and utsuri appear. Nashiji-hada may come from proper material and hardening work. And the appeaprance of it is brought up by good polishing. To recognize the difference between "layer pattern (hada)" and "grain of particles (chikei)" is very important to study steel. But most of ordinary blades have a steel that has only an appearance of the layer pattern. Opposite of nashiji-hada is "mujigane". It has no effects by particles and it looks like a mirror surface.